The story has the hook of a titillating local scandal: A married track coach goes to prom with a 17-year-old boy and loses her job over it. She's 41, her husband is 73, and they have a son who runs track too, yet some chaperone at the Condon (Ore.) Prom saw something worth complaining about, and now the coach is out. Shakespeare on State Route 19, you hope. Details aren't there yet. The coach, Melissa Bowerman, says nothing untoward happened. She took the kid out of sympathy, and out of a maternal instinct: he didn't have a date, and she thought she could talk him into doing better in English class. They played ping-pong, and danced to a few slow songs, and that's it. The district superintendent implies that wasn't it. He speaks of "potential details that arose" and says "there is way more to that story than just a date to the prom" and other generalities a bureaucrat uses when they think a situation might end up in court, one way or another. But he says there's no going back, and Melissa Bowerman will not be around next year, and if that means her husband Jon leaves too—as he promises he will—then so be it. But this involves more than an older woman and a young boy. Jon and Melissa Bowerman are the son and daughter-in-law of Bill Bowerman, a co-founder of Nike and the brains behind some of the company's early products. Phil Knight was the businessman and marketer, but Nike wouldn't exist without Bill Bowerman. It was his Nike Cortez that became the company's first must-have shoe and set the company on its path to industry supremacy. It was his waffle-patterned sole that set the template for the next half-century of sneakers. Even for a state where local sports are more or less Nike's R&D and marketing departments, the Condon/Wheeler track team is a notable outpost of the corporate empire. In 1999, when Jon and Melissa Bowerman's son went out for the track squad, it was a tiny team on the wrong side of the Cascades, blending athletes from two small local schools. The parents volunteered to be track coaches. Within the year, a Nike executive gave them a call. Would they mind offering up their property to be the hiding place of an item for a GPS treasure hunt? The hunt was part of the Wild Canyon Games and was all for charity—and Nike was the title sponsor. The couple was happy to be a part, and ohbytheway, our track team could use a little help. So the boxes came. A roomful of boxes, containing Nike shoes, Nike singlets, Nike warm-ups and Nike equipment of all kinds. In 2010, the Bowermans found the waffle iron that had been the inspiration for Bill Bowerman's legendary waffle sole. They reached out to Nike—would you be interested? Nike was. The Bowermans donated the iron—which now stands on display at Nike headquarters in Beaverton—and Nike donated to Condon/Wheeler track and field. A "generous sum," though no one will say how much. The Wild Canyon Games, still sponsored by Nike, continued to be one of Condon/Wheeler's biggest benefactors. Last year it was announced that the team would be having an entirely new track built, thanks to the generosity of Games sponsors and participants. Condon/Wheeler track is no longer the struggling program Jon and Melissa Bowerman found. 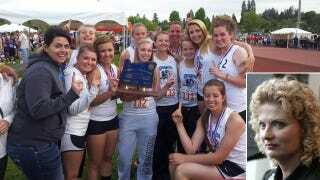 Then, it had only six kids; now there are 39 athletes, more than half the total enrollment of both schools. The girls team won its first state championship this past Saturday, on the back of star sophomore Ellie Logan, who's already on the radar of college programs—including the University of Oregon, which doesn't let a top in-state recruit go by without at least taking a look. Nike wouldn't comment when asked if their support of Condon/Wheeler (the Knights, natch) would continue if the Bowermans don't return next season, and the school district remains mum. But Nike has shown it's certainly willing to ride out a scandal in one of its pet athletic programs. And continuing this grand experiment in Eastern Oregon is easily done, and in the company's best interest. The Bowermans are mascots, at best, as it's really been Phil Knight's company since the '70s. They've built an entire program from the ground up—with Nike cash, with Nike gear, with Nike hype—and turned it into a state power. Be it benevolent charity or more of the sneaker industry's attempts to shape the futures of younger and younger athletes, that's the sort of in that money can buy.